For this mani I painted my nails with Astor Fashion Studio 229 Soft Hydrangea (2 coats). I love this colour. It’s stunningly beautiful! I also decided to stamp! 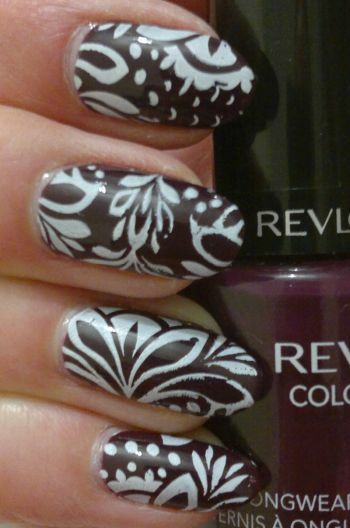 I used Pueen‘s 51 plate (which is part of Pueen‘s Stamping Buffet collection) and Revlon Brilliant Strength 110 Hypnotize. I really liked this mani. 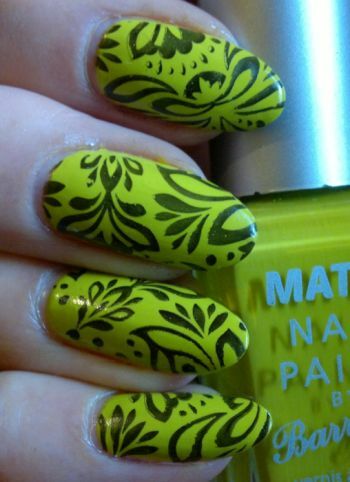 I love the bright and powerful base colour, and I think the golden images add to the summery feel of this mani. Hi there! Let me show you a mani I did not too long ago! 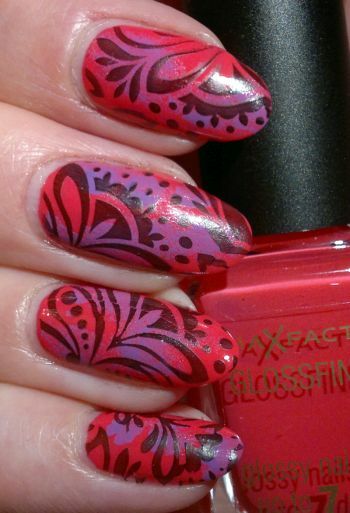 For this mani I painted my nails with Max Factor Glossfinity 95 Flaming Pink (2 coats). This is a lovely polish. Great colour, quick-dry and easy to work with formula, lovely glossy finish… truly great stuff. Thank you, Max Factor! I used a small piece of a make-up sponge to apply a few blobs of purple polish (Rimmel Lasting Finish Pro 370 Wild Orchid). I liked this mani. It didn’t look perfect, but I really liked the bright and optimistic look of it. What colour nail polish are you wearing at the moment? Feel free to comment, and thanks for reading! Hi there! Today’s mani is my attempt at Exotic Nails which is part of the A-Z Nail Art Challenge. For this mani I painted my nails with Barry M Waikiki. I like this polish. Great formula, awesome colour! I used Pueen’s 51 plate (which is part of Pueen’s Stamping Buffet collection). I think this mani is quite pretty. The colour really pops, and I love the images. 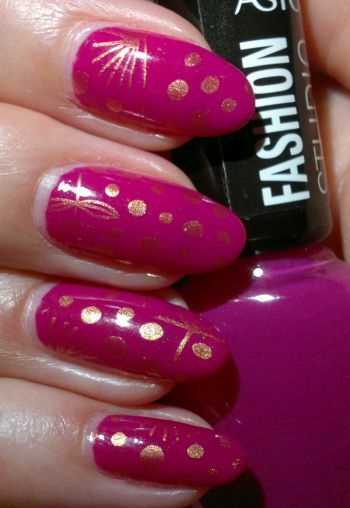 This stamping plate is one of my favourites, and I’m always happy to use it! Hi there! Today’s post is about a simple mani I did the other day. I painted my nails with Astor Fashion Studio 085. I like the cool pink shade and the easy to work with and quick-dry formula. However, this Astor polish is a scented polish – and the burned raspberry scent annoyed me quite a bit. Scented polish… who thought this up? Anyway, let’s get to step 2! 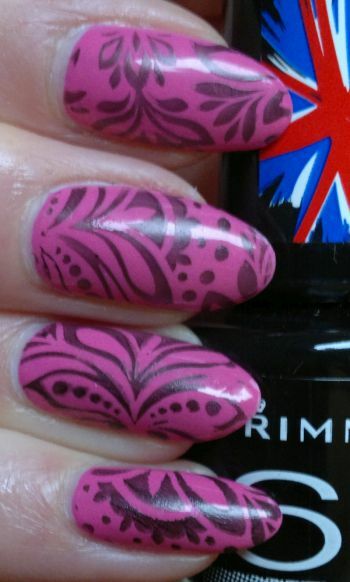 I wanted to see if Rimmel 60 Seconds 820 Hot Black To Go stamped well. So I gave it a try – and it worked out fine! Do you agree? I think this mani turned out quite alright. I like it! What do you think? Feel free to get in touch via the comments. And thanks for reading! Hi there! I haven’t done a nail post in a while. A few weeks ago I broke two nails (one on each hand), and then I made the mistake of trying out false nail tips (Never again!) which made it even worse. So I’ve been patient, and now I’m happy to show you this cute mani from last week. I painted my nails with Rimmel Lycra Pro 313 Cocktail Passion, a bright and gorgeous orangey-pinkish coral shade. 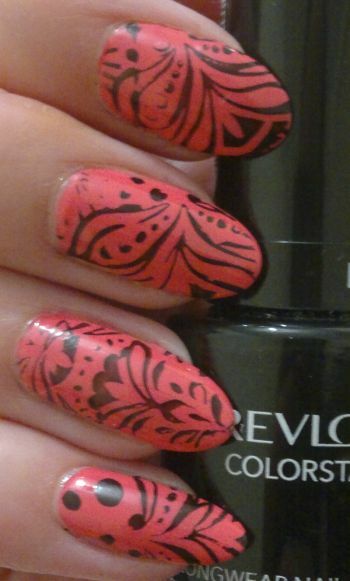 I then stamped on a floral image – with the help of my trusted favourite black polish – Revlon Colorstay 270 Stiletto. The floral image is from Pueen’s 51 plate. This plate is available as part of Pueen’s beautiful Stamping Buffet collection. I really liked this mani. I love the Rimmel polish and Pueen’s 51 plate is just so pretty! 🙂 Feel free to comment and thanks for stopping by.